Pet parents, you know how there are lists online of all the things that are toxic to dogs? 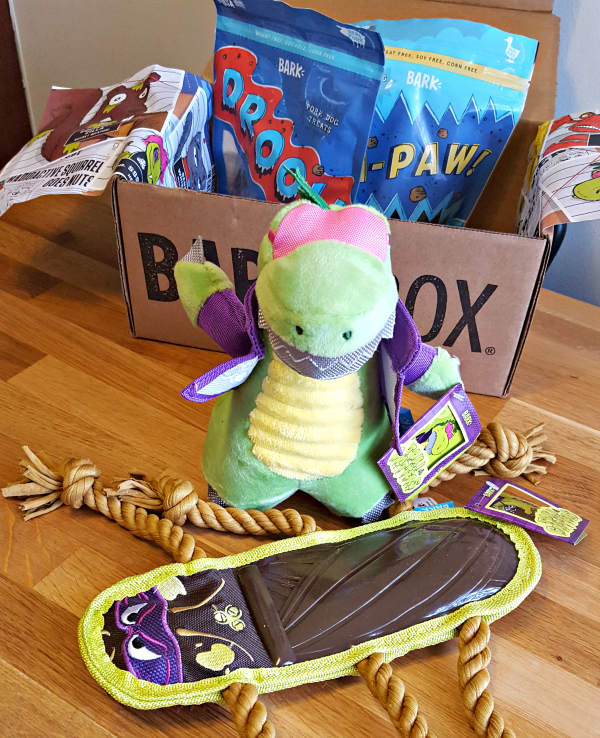 Well, this month’s BarkBox for dogs is filled with cold-blooded villians and scary henchmen called Toxic Critters, but don’t worry, they are totally pet-friendly and dog-approved! 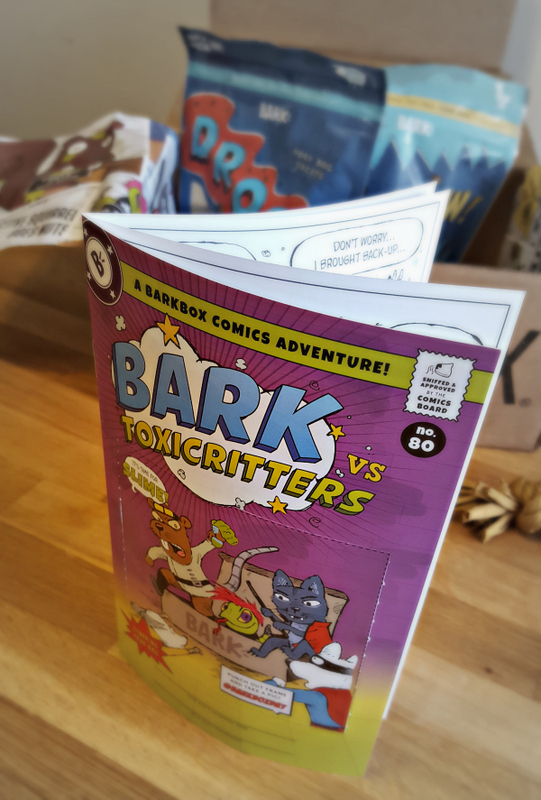 Every month’s BarkBox has a different theme, and this month’s theme is the comic book adventure: BARK vs. Toxicritters. 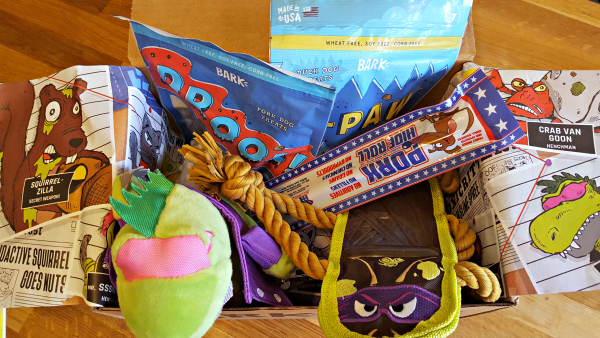 As with each month’s dog subscription box from BarkBox, this one included 2 fun toys inspired by the theme, plus 2 full-size bags of dog treats and a tasty meat chew. There are also fun extras and surprises in most boxes, like the comic book included in our box this month to go along with the theme. DROOL! Pork Dog Treats ($8 retail value) These wide pork strip treats definitely have some chew but aren’t completely hard. They’re made with pork, cheese, peas and a few other all-natural ingredients that are sure to make your dog drool. KA-PAW! Duck Dog Treats ($8 retail value) Skinny duck chews, also made with all-natural ingredients. 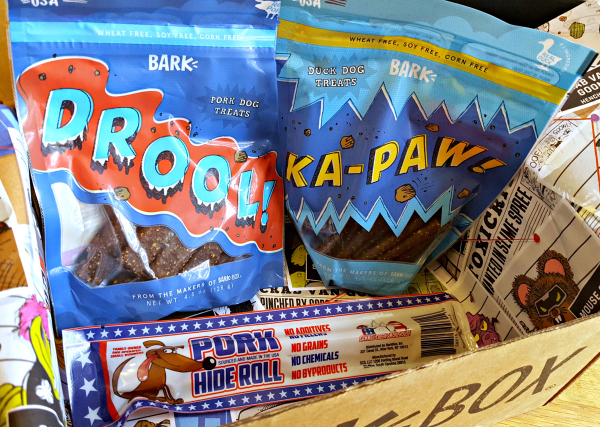 As with all BarkBox treats, these are Made in the USA and are wheat free, soy free and corn free. Pork Hide Roll Dog Chew ($4 retail value) Made of 100% human-grade all-natural pork hide from the fine folks at Sawmill Creek Smokehouse in South Carolina, USA. Although we aren’t big on hide treats in general, we love that this one contains no chemicals, byproducts or additives, so we feel great about sharing it with Daisy’s pal who absolutely loves hide treats! 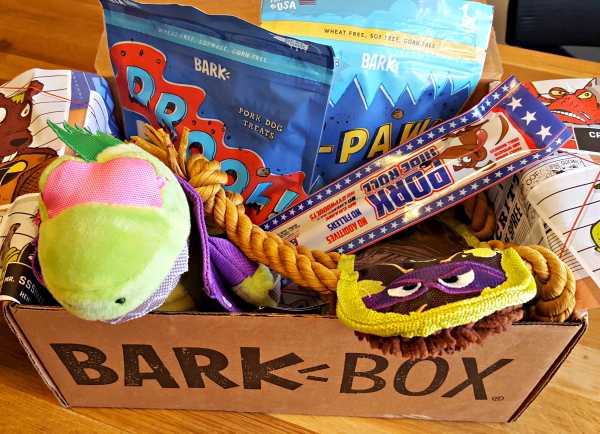 We were really happy with this month’s BarkBox treats, but know that if you every receive a toy or treat that doesn’t make you happy or that isn’t suitable for your dog, BarkBox will send you a FREE replacement with no questions asked. You don’t even have to send back the unwanted item. They encourage you to donate or share it, and will send you a replacement more to your dog’s liking! It’s part of their Scout’s Honor Satisfaction Guarantee that comes with every delivery. 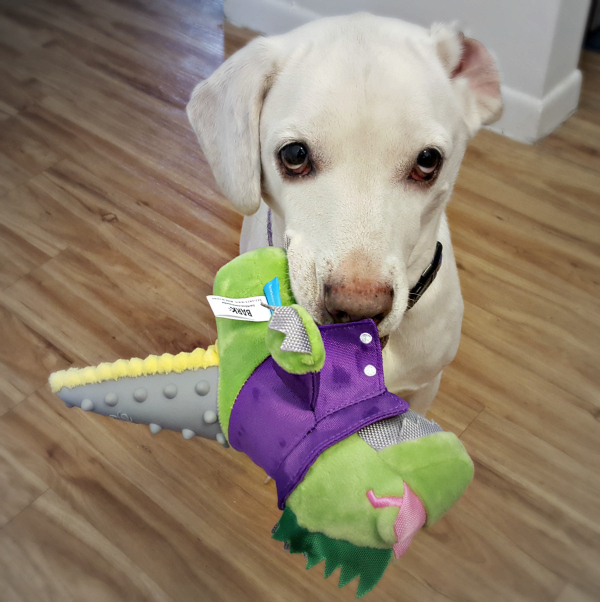 Croc Jaw Dog Toy ($14 retail value) A true comic book henchman, complete with colorful disguise! 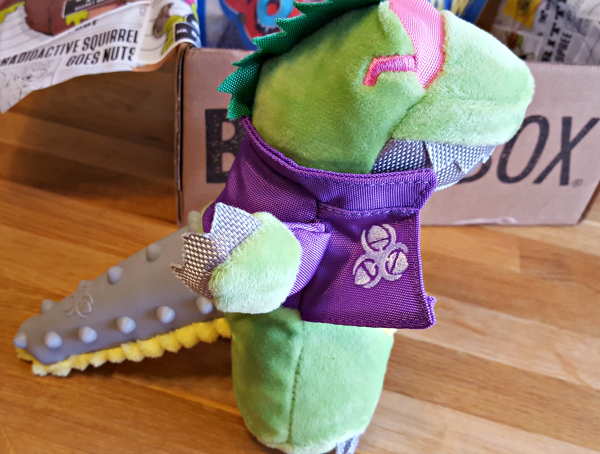 This cold-blooded creep grunts when he squeaks, has tough ballistic nylon detailing, and is double stuffed with fluff. 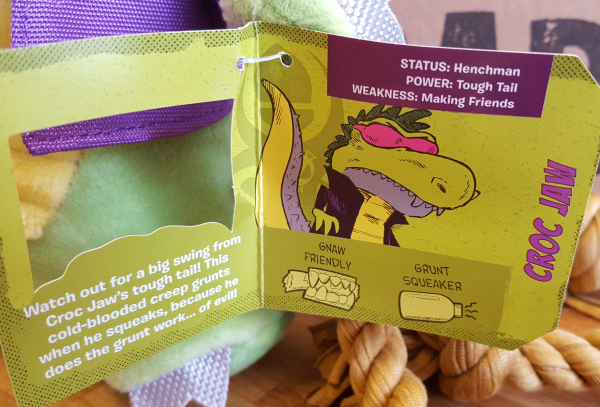 We love the texture of his tail, and also that BarkBox has started labeling their toys with info on the features of each one. 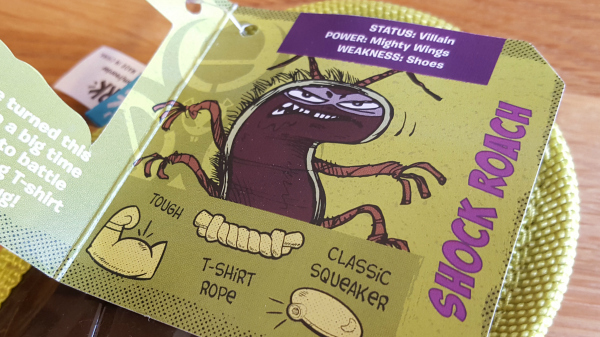 Shock Roach Dog Toy ($16 retail value) I’m not gonna lie, this toy creeps me out. Living in South Florida, we try extra hard to avoid this sort of toxic critter, but Daisy seems to really like this evil villian. He’s got tug ropes for legs and a hard shell along with a soft microfiber textured underbelly. His insides are squeakers and crinkle material. By our calculation, this month’s BarkBox had $50 worth of dog toys and treats if you were to purchase them all separately. That’s an amazing value when you consider that subscription prices start at $21/month with free US and Canadian shipping. 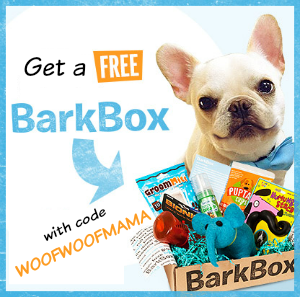 New BarkBox Coupon: Double up your FIRST BarkBox for FREE. That’s FOUR toys, FOUR bags of treats, and TWO chews in one box! Now thru 7/31, get a FREE UPGRADE to DOUBLE DELUXE on your first month with the purchase of a 6 or 12 month subscription. 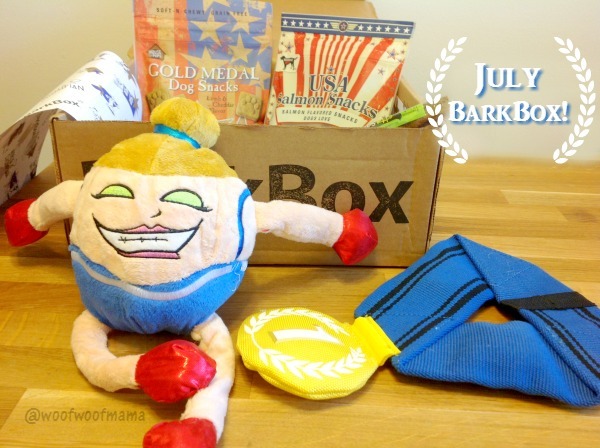 Use this link to get the deal and customize a BarkBox for your dog’s size and food allergies. Are you looking forward to the Summer Olympics? 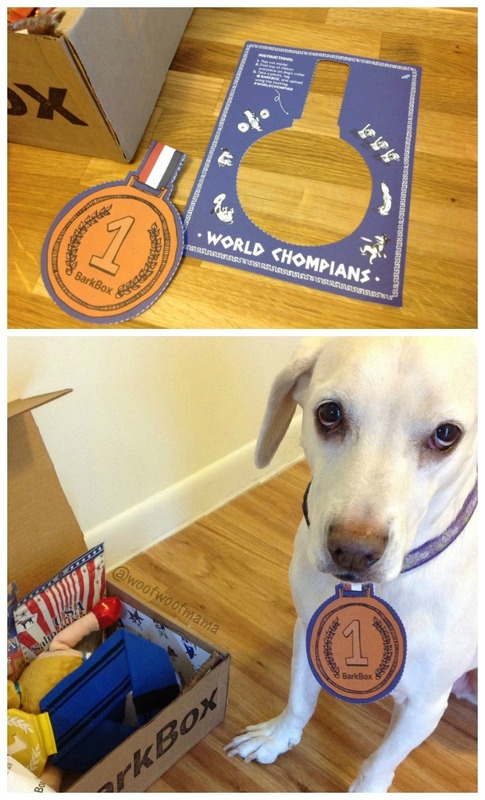 We sure are and thanks to this month’s super cute BarkBox theme, Daisy can get in on the Gold Medal action, too! 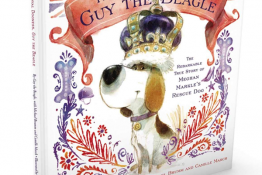 BarkBox is the #1 subscription box service for dogs for a reason. 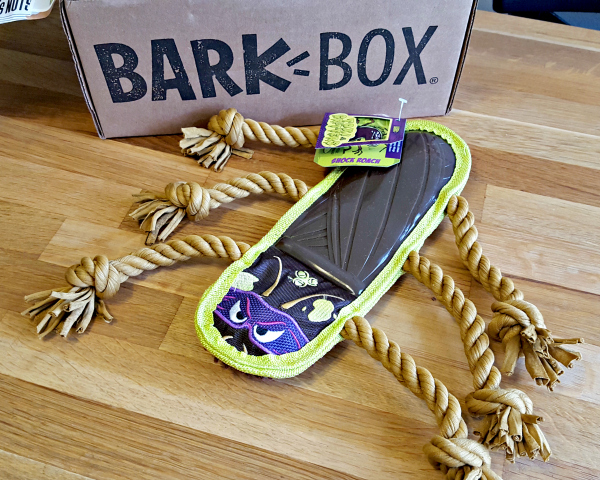 In addition to having the most unique toys and treats…often they are made exclusively for the company, the BarkBox folks are also super creative and add fun extras to make each box extra special. This month the box included a pop out medal for Daisy to wear. 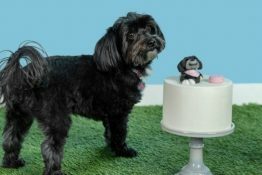 As you may already know, each BarkBox is customized for your dog’s size as well as for allergies. 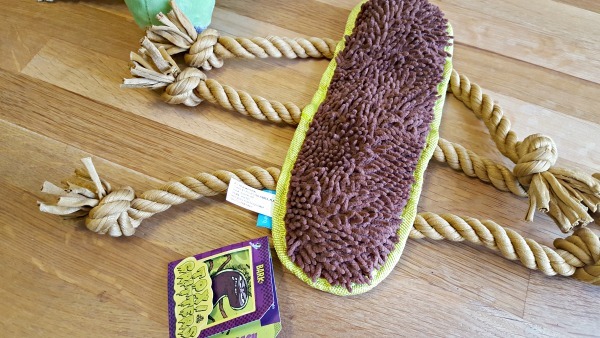 You can also specify that your dog is a Heavy Chewer and they will include toys that are especially heavy duty! 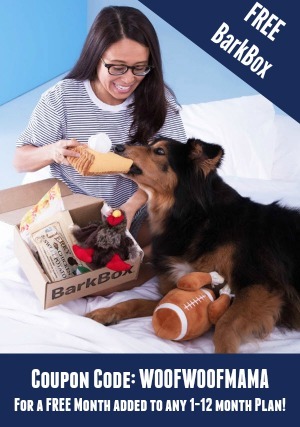 BarkBox starts as low as $20/month and is a fantastic value over buying individual items. It varies but this month our BarkBox had a retail value of $38. 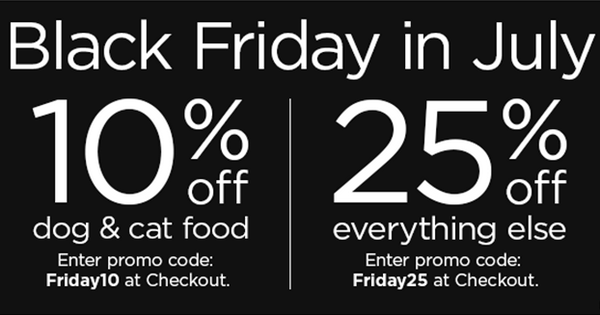 Petco Black Friday in July Promo Codes for 10% OFF Pet Food + 25% OFF Supplies! There is NO time to waste so I’ll keep this short and sweet…today is Petco Black Friday in July! That means special Petco Promo Codes good for 10% OFF dog food and cat food AND 25% OFF everything else. It’s a super fantastic opportunity to stock up on pet supplies, food, treats and anything else you need or want for your dog, cat, fish, bird, bunny, snake or other critter you call family! 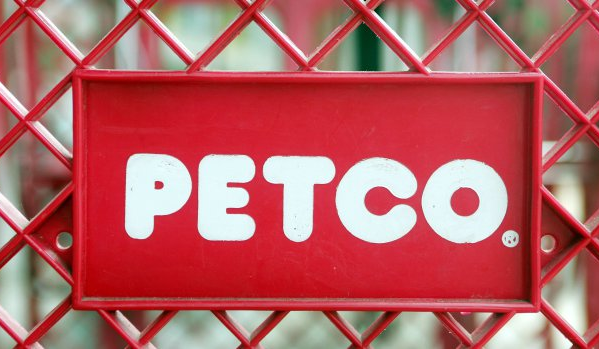 Head on over to Petco.com and be sure to use promo code Friday10 for 10% OFF pet food or Friday25 for 25% OFF other pet supplies, gear and stuff. Either way, you’ll get FREE Shipping on orders of $49+. 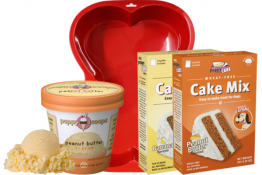 Click here to see featured Petco deals and get started. 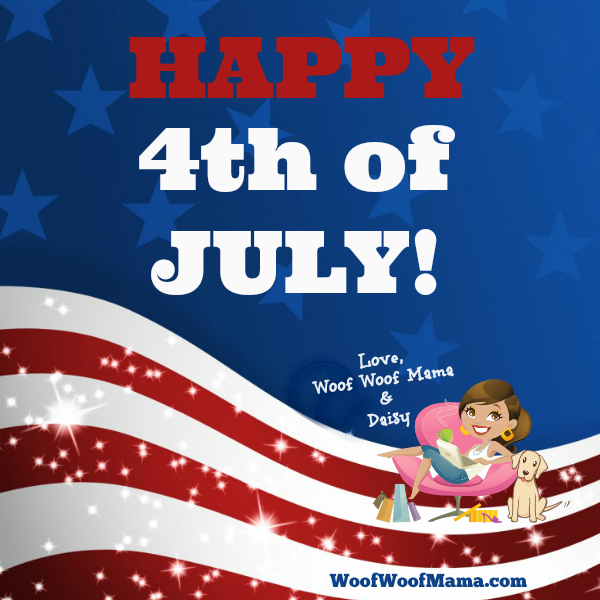 Wishing you and your fur kids a very happy and safe 4th of July! Have FUN but remember to keep your pets indoors, away from BBQ grills, sparklers and fireworks! 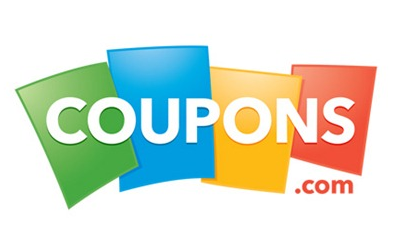 Printable Coupons Alert: Roundup of Coupons Ending in July – Don’t Miss Out!